Readable Writing gets great results—much improved student writing—in record time. Plus–it engages students, gets them completely involved, wakes them up, and lights up their eyes. Readable Writing hammers home a few key writing behaviors that make all the difference. Its exercises build from the simple in Week 1 to quite complex in Week 12. It’s a well-tested course that I’ve taught more than 70 times at Boston-area colleges and universities. The first eight weeks covers sentences and the last six weeks essay writing. I like your approach very much, with the strong emphasis on the concrete. I also like the multitude of exercises, which hammer the ideas home and make for an active experience for the students (and a time-saver for the instructor). If I were teaching composition this coming year I would definitely employ your text, and I will hang on to it and recommend it if anyone asks. Please click around this web site. 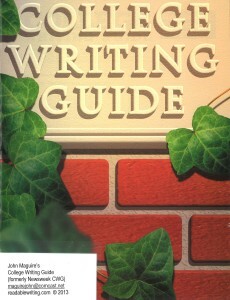 You’ll find several articles, sample pages from the book, and samples of student writing. You really need to look at the samples of student work to see what this course can do. The best way to see how this approach works is to order a copy of the book and look for yourself. You will find an unusual textbook where the explanatory material is concise and interesting. Most important, you’ll find bushel-baskets of all kinds of exercises, which can be done in the classroom and for homework. There’s a complete answer key. If your students work the exercises, their writing will change from vague and confusing to vivid and concrete. You’ll spend much less time reading and having to grade terrible papers. Training students to be readable is a simple and logical idea, and when you do that, students write better, and much faster than you would believe. Every conscientious writing instructor will want to check out this new approach that is good for your students and will save you a lot of work. Order it and see for yourself? If you like what you see, there’s still time to get it to your college bookstore. And the book retails for less than $20! "If you don’t let them write full essays for a while, and make them focus on the quality of sentences, they begin to get it." -- Kim Holcomb, Ohio U.